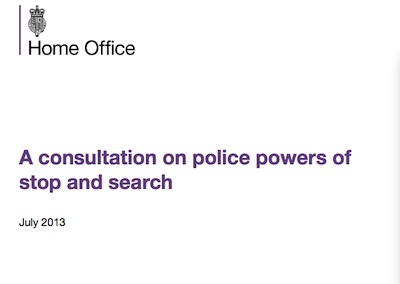 The Home Office are currently running a consultation on UK Police stop and search powers. Does she agree that when the police do ask people for information, such as name and address, they should make it clear whether compliance with the request is a requirement or purely voluntary? I can assure my hon. Friend that we will, of course, make it clear where information is required and where it is voluntary. I would like to explicitly submit this commitment the Home Secretary made in Parliament to the consultation process to ensure it is not overlooked. I was encouraged by the Home Secretary’s assurance and hope that action following the consultation includes taking steps to ensure that the police are clear about the extent of their powers when stopping or stopping and searching someone. I think it is particularly important for the police to be clear on if the individual stopped is required, or is merely being asked, to provide information such as their name and address. Where information is demanded (rather than requested) the police should be clear about the basis in law for the demand, along with any relevant grounds for the stop and search. I am concerned about the police misleading people as to the extent of their powers in relation to stops and stops and searches and more broadly. To maintain policing by consent, to keep a good relationship between the police and the public I think it is important that the police do not routinely lie, mislead, or misrepresent their powers, when dealing with the public. For the police not to mislead people as to the extent of their powers they will have to know what their powers are themselves; this will probably require better training of police officers. Modification of the PACE codes following this consultation should in my view be used be an opportunity to make improvements requiring the police to ensure the public are in no doubt as to the extent of relevant police powers during interactions. If modification of the PACE codes is the route chosen to strengthen safeguards for those being stopped and stopped and searched then the requirement for the police to follow the PACE codes should be re-stated. Where police lying can be justified I think it ought be carefully regulated and overseen. I don’t think the police should ever lie about the extent of their powers while carrying out a stop and search. I would have liked to see the treatment of electronic devices during searches considered as a major part of this consultation. People are increasingly carrying around large amounts of personal, often very private, information, primarily on phones but also on laptops, tablets, cameras and other devices and storage media. Information held on devices in the possession of someone to be searched may belong to others, eg. their friends or employers. Devices may also hold login details enabling those in possession of the device to access information held online. I think it’s important to ensure any searches of electronic devices are proportionate. My own view is electronic devices should not be searched without a warrant, or unless the individual in question has been arrested, ie. electronic devices should not be accessible by the police when carrying out a stop-search. Police officers need to be trained, to ensure they are aware they cannot demand access to, or deletion of, material held on electronic devices during a stop and search. Phones and other devices should not be confiscated for the purposes of examination as a result of a stop and search. Confiscation of phones and electronic devices following a stop and search can result in significant, often disproportional, impact on the individual who is stopped and searched, and potentially others. You’d Describe Yourself as a British White Male. Yes? I would like to see the police cease routinely asking those stopped and searched about their nationality and ethnicity. I have watched enough Police Stop Camera Action Interceptor Wars and the like to know the ethnicity and nationality questions wind people up. They prompt people of all ethnicities and nationalities wonder to what extent the police action was based not on specific individual grounds but on their apparent ethnicity and nationality. I would suggest ethnicity data ought only be recorded where those overseeing the police have requested it. What is collected and recorded should in my view be tailored to any specific local concerns. Recently, in relation to the policing of some lakes in Cambridge the police stated they were making use of the site uncomfortable for people through carrying out drug searches. Such use of powers to stop and search should be stopped. In 51% of 391 stop searches the police officer did not identify themselves. Research was cited saying only a third of stop and searches were recorded despite the law requiring all to be. I think these concerns all ought be addressed by the Government’s changes to the way stop and search is operated following this consultation. There needs to be better compliance with the law, PACE codes, and relevant guidance by the police. A suggestion has been made to my local police force that they should stop and search people in crime hotspot areas even if the officers have no specific grounds for suspicion in relation to an individual. The idea is if the police move their justification for a stop and search away from factors relating to an individual to factors relating to a place they will be in a stronger position to defend themselves against claims race is a factor in their decisions on who to stop and search. I don’t want to see groundless searches extended to all crime hotspots. Crime hotspots generally correlate with where there are large numbers of people. City centres for example are areas where crimes occur at a higher density than the city suburbs. I don’t want to see the police conducting ground-less searches in city centres, shopping centres and the like. I don’t want the police given the powers to stop and search me just because I’ve entered an area they’ve defined as high crime area. I think people being stopped and searched by the police without specific individual grounds will feel that they have been unjustly and unfairly targeted for a search. I think if the practice was to be extended to become a routine policing tool those subjected to stops and searches just for being in a crime hot spot area would feel the police action unfair and unjust; I think stop and search without grounds has the potential to antagonise people and damage the reputation of, and the public’s relationship with, the police. The recent report by Her Majesty’s Inspectorate of Constabulary (HMIC) published titled: Stop and Search Powers: Are the police using them effectively and fairly? showed officers are recording illegal grounds for searches eg. just “crime hotspot”; oversight procedures need to ensure such cases are identified and all possible is done to prevent recurrence. Validation of form responses on electronic recording systems may make it impossible to, for example, enter illegal grounds for searches. Misleading statistics could be produced if different forces use systems with different validation tolerances, or default options, for entering information. Perhaps electronic recording systems could be programmed to alert police officers when they are attempting to use illegal grounds for a search? Electronic systems could remind police officers of their powers as well as serving to create a record stops and searches. There needs to be routine, public, monitoring of police performance statistics, including on stop and search. This is something which was done by Cambridgeshire Police Authority which we’ve lost with our transition to a Police and Crime Commissioner. I have urged our local councillors to step up their scrutiny of the police via their relevant scrutiny committee; perhaps this is something they could take on. Police forces making data on stop and search public would enable all those interested to monitor how the powers were being used and to act if the powers are being used inappropriately. Local police priority setting groups (who were I live in Cambridge are elected local councillors) should be able to request data on how stop and search is being used in their areas; to set priorities including on stop and search practices, and to hold the local police to account for their performance against those priorities. In order to try and give my comments the best chance of being considered I decided to submit them via the online survey form. It is hard to engage with nonsensical and leading questions. 1. To what extent do you agree or disagree that the use of police powers of stop and search is effective in preventing and detecting crime and anti-social behaviour? I strongly agree. I think police officers having the power to stop and search someone, where there are specific individual grounds justifying a search, are essential for effective policing. 2. What are, in your view, the types of crime and anti-social behaviour that can be tackled effectively through the application of stop and search powers? Burglary, robbery, violent crime involving weapons, drug use and dealing, theft, handling stolen goods, fraud and many more; the list is long. There will be occasions when a stop and search is the most appropriate and proportionate course of action; there can be a grounds for a search, but not, at first, grounds for arrest. 3. To what extent do you agree that the arrest rate following stop and search events is a useful measure of the power’s effectiveness? I strongly disagree. If all those searched ended being arrested that would suggest to me the threshold being used for a search was that which ought be used for an arrest. I think it is right there is a lower threshold for a search; so it would be expected that in some cases a search would not turn up anything justifying further action, or may demonstrate that the officer’s suspicions were not justified. I think “further action as a result of item(s) found during the search” (for which arrest is a poor proxy) is a key statistic when comparing the use of stop and search in relation different sets of people, be it people of different ethnicities, ages, or people who are stopped in different places, times, or by different forces where the grounds for the search justified, it is not though a measure of the “success” of a power. I don’t think asking about the measure of the effectiveness of the power to stop and search really makes any sense; it’s like asking about how to measure the effectiveness of the power of arrest. Both are essential, and obviously effective, powers; the question is are they being used appropriately and proportionally. I think the key thing to monitor in relation to stop and search is actual, and perceived, abuse and misuse of the powers. 4. In your view, what other things, beyond the number of resulting arrests, should be considered when assessing how effective the powers of stop and search are? i disagree with the premise that “assessing how effective the powers of stop and search are” is something it makes any sense to attempt to do. Assessing how effective an authorisation under S60 of the Criminal Justice and Public Order Act 1994 could be monitored by looking at the rates of violent crime in similar areas / circumstances without such an order; or looking at the numbers of “dangerous instruments or offensive weapons” recovered as a result of searches within the authorised area carried out without individual grounds. What matters is public confidence in the police; and assurance that police powers are being used reasonably and proportionately, which in the case of stop and search to me means primarily ensuring stops and searches are only carried out when there are genuine individual grounds for doing so. 5. To what extent do you agree or disagree that the ‘with reasonable grounds’ stop and search powers, [described in the paragraphs above], are used by police in a way which effectively balances public protection with individual freedoms? There is little proactively published information about the police use of stop and search. I am not concerned about stops and searches carried out with genuine “reasonable grounds”; I am concerned about stops and searches carried out under these provisions but without genuinely reasonable grounds, eg. carrying out a search because an individual or vehicle is in an area considered a crime hotspot, or due to what an individual is wearing. 6. To what extent do you agree or disagree that the ‘without reasonable grounds’ stop and search powers described in the paragraphs above are used by police in a way which effectively balances public protection with individual freedoms? 7. To what extent do you agree that it is right that the police are under a national requirement to record the information set out above in respect of each stop and search? I think the object of the search, grounds, identity of the officer, date, time and place ought be recorded and this information provided to the person being searched. (My view is that even for stop without a search, where the police ask someone to account for their actions, a simple form of “receipt” ought be provided eg. the officer’s business card noting the fact a stop occurred along with the time and date; enabling the individual to follow-up if desired). As for ethnicity, I would like to see the police cease routinely asking those stopped and searched about their nationality and ethnicity. I strongly disagree; citing the points in the HMIC’s report: Stop and Search Powers: Are the police using them effectively noted above. 10. What would give you greater confidence in the police’s use of stop and search powers? Please give reasons. The police following the law; I think the law related to searches based on reasonable grounds is good, the problem comes with the police misusing, or in some cases apparently misunderstanding, their powers. I think any authorisation(s) made under section 60 and 60AA of the Criminal Justice and Public Order Act 1994 ought be much more targeted ie. they should cover much narrower geographical areas for shorter periods of time. There should be better publicity surrounding the orders and the grounds for making them. I repeated the section from the above article on “Police Ought Be Clear and Honest About their Powers”. 11. To what extent do you agree or disagree that the current requirement to explain the reasons for the stop and search make the use of the power more fair and transparent? If the question is intended to ask if the requirement for the police to explain the reason for a stop and search makes a stop and search more fair and transparent than if no reasons were given then I strongly agree. Clearly giving reasons makes the process more transparent; explaining the reasons is likley, if they are justified, for the process to appear fair; if the reasons given do not amount to sufficient grounds obviously explaining the insufficient grounds won’t help make the stop and search feel fair or justified. 12. Before today, had you heard of the police.uk website? 13. To what extent do you agree or disagree that police.uk should contain information on stop and search in your local area? Strongly agree. All mappable police statistics ought be made available via the service so the public, and others can monitor how the police are using their powers. 14. To what extent do you agree or disagree that local communities should have direct involvement in deciding how the police use their stop and search powers? Strongly agree. We all have to consider what our police force do on our behalf, not just in relation to stop and search but with all their activities. 15. In your view, how might local communities be directly involved in decisions concerning the use of stop and search powers? I repeated my section from the above article on Monitoring and Oversight. 16. Are there are any other views or comments that you would like to add in relation to stop and search powers that were not covered by the other questions in this consultation? I did not answer the questions on my age, gender, ethnicity or where I live. People have until midnight tomorrow (Tuesday 24th September) to take part in a Home Office consultation on stop and search. Personally I find it much easier to work out which day 00:01 or 23:59 is in than “midnight”. The short answer is ‘both’, because the use of the word midnight is heavily dependent on its context. There is no rule saying how the word is to be used, so it must be used with great care. At the Home Affairs Select Committee on Tuesday 29 October 2013 Cambridge MP Julian Huppert asked if the proposed new code of ethics for the police (which is currently in draft form and under consultation) would require the police to explain when they have a power to demand information from someone as opposed to merely requesting it. Julian Huppert: One issue which is raised often with me is police officers requiring information from people where they are not legally required to provide that. Do you think that would count as a breach of the rules about orders and instructions? If an officer demands a name or address when there is no requirement would you expect officers to make it clear when something is being given voluntarily and when something is being given compulsorily. Shirley Pearce: From my perspective I think I would yes. Alex Marshall: Yes. If an officer is using a power they should make clear which power they are using and why. Shirley Pearce: That’s sort of the essence of it. Julian Huppert: Thank you. I’m very pleased to hear that clarity. I think this is excellent. It would have been ideal if Alex Marshall had said a police officer ought make clear if they are not using a power and merely making a request too, but he did start by saying simply: “Yes”. I think this will be a relatively significant change to people’s interaction with the police. The onus will no longer be on the person the police have, for example stopped, to have a good grasp of the officer’s powers, the officer will have to explain any powers they want to use, or explain they’re not using any powers but simply making a request which can be ignored. The committee heard that the code of ethics would be treated like other codes of practice (presumably like the PACE Codes) and [nominally] put before parliament, to make it something the police have to follow. If this route is to be followed the status of the Code of Ethics, (and the PACE codes for that matter), needs to be made very clear. 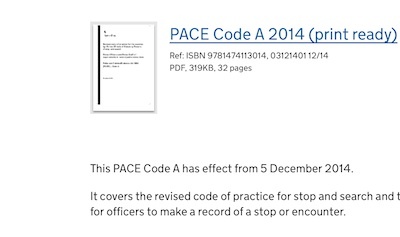 Cambrigeshire Police have previously considered the PACE codes merely “guidance”. In my view the PACE codes are a bit of an anachronistic anomaly, with special rules for changing them; they’re neither primary or secondary legislation they kind of sit between the two and while they’re “put before Parliament” there’s no substantive scrutiny of changes. In our position we say that every officer who uses stop and search powers should be able to answer the question: “Why did you stop me?” It is not enough to say “Because I can”, or “I don’t have to give a reason”. The officer should be able to respond by explaining the reasons, which could include citing the intelligence available. the Home Office will work with Chief Constables and Police and Crime Commissioners to explore the possibility of the quick and efficient recording of information on the use of stop and search via the new Emergency Services Network and promote the practice to all forces in England and Wales. In addition the Home Secretary told the House of Commons on the 30th of April that forces involved in the “Best Use of Stop and Search Scheme” (which she has invited all forces to join) will record more details of stops and searches in more detail to show the link, or lack of a link, between the object of the search and it’s outcome, allowing us to see how well forces are interpreting the reasonable grounds for suspicion they are supposed to have to use their stop and search powers in accordance with law. Some respondents held that whilst explaining the reasons for the stop and search, the police should be under an obligation to inform the person subject to the procedure of their statutory rights. However this was not one of the list of things the Government promised to implement following the review. The suggestion is that the requirments are already in place. Overall the tone of the actions are to strengthen the PACE codes; so hopefully the requirement to explain the powers being used will be caught too. Cambridgeshire police has joined a scheme to drive down the abuse of stop and search powers. I'd like Cambs’ Police & Crime Cmmr Bright to accept Home Sec’s invitation for @CambsCops to join the “Best use of Stop and Search” scheme. 4.3A For the purposes of completing the search record, there is no requirement to record the name, address and date of birth of the person searched or the person in charge of a vehicle which is searched. The person is under no obligation to provide this information and they should not be asked to provide it for the purpose of completing the record. There is no mention of searching phones and other electronic devices. The amendments to Code A clarify the meaning of “reasonable grounds for suspicion” in the context of stop and search powers and its application to individuals and groups. Further, they emphasize that the misuse of stop and search powers will lead to formal performance or disciplinary proceedings. basis for that suspicion based on facts, information and/or intelligence which are relevant to the likelihood that the object in question will be found, so that a reasonable person would be entitled to reach the same conclusion based on the same facts and information and/or intelligence. 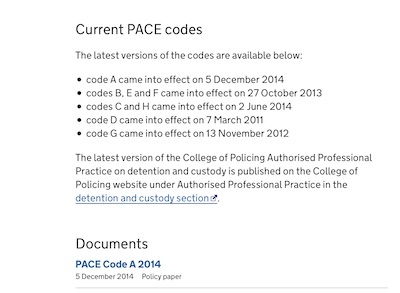 The government are listing the latest version as the current PACE Code on its Police and Criminal Evidence Act 1984 (PACE): current versions webpage too; so if they have got this wrong they’ve got it very wrong. however the link provided is to the 2013 version. It is disappointing that the “updated” and “full page history” links on these pages do not show the edits; it appears they can be over-rided to hide the Government’s embarrassing mistakes. This could be a problem as people may have acted on the basis of material published by the Government and I think it would be desirable to have an honest revision history. The above article focuses on searches of electronic devices during stop and search, but I did suggest that searches after an arrest might be acceptable; this is in-line with the current law on searching other property eg. your home, if you are arrested there’s no need for a warrant then either. Now I’m wondering if there should be independent oversight of the police even if there has been an arrest, for searches of both electronic devices and homes and other locations/property.